Wisdom of Life. : A cup of tea with love and passion. I love visiting to Ihsan and Kabeer homes. Kabeer is Ihsan's uncle who stayed at different location. Each time I visited them, Ihsan's mother and Kabeer's wife would prepare a cup of typical Indian tea for me. They know I am a tea drinker, who enjoyed special quality tea. I know much about tea because I was brought up in a Chinese coffee shop, when I was young. Besides studying, I had to assist my father's shop. I served customers who patronized our place and at times I prepared drinks as well. 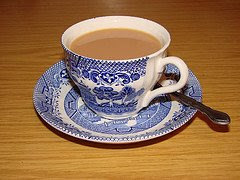 With the many years of drinking tea, I could see whether a cup of tea is well served by its colour and aroma. Is really sad today we don't get good tea being sold in town. Whether are from the five stars hotels or the normal coffee shops or restaurants, the best cup of tea is hardly available. Not the teas from Ihsan's mother and Kabeer's wife. They are superb because their teas are prepared with plenty of 'love' added. First, they make sure the tea dusts are specially purchased from India or Ceylon, which are of the best and fresh qualities type. On preparing the beverage, the ladies have to make sure the water is properly boiled. Hotness of the tea is vital important. Right spices are added to bring out the aroma. Sufficient fresh milk is mixed with a bit of sugar to go by the taste. As I sipped my tea, the ladies of the house stood a far to observe my expression. They would not be sitting with me as they are the very shy and conservative Muslim females. I could only sound to them with a 'mmmmmmmMMMM!!!' Meaning to say, the tea is sensational brought out from my heart. Meanwhile I could see their eyes grew with joy with an acceptance of sincere friendship. Making a cup of tea is easy but making a cup of tea with love and passion has to be from the mind and the heart. I know these two great ladies have the love. Thank you to these wonderful friends I have gathered through my journey of life. You really make my life so meaningful just by drinking your cups of love tea. Specially to these two ladies I adore - "Real happiness is the pure, comforting, and delightful feeling that comes after giving and renouncing." One who has a loving heart is the greatest! I can imagine the beauty of your cup of tea ! You like to have coffee, tea or me then? Pls let me know. Thanks for wonderful comment. Wow... gotta tell mom about this. Tell her I really love drinking her home make tea...is the best! I was tickled when I read your naughty question. I like to have coffee if you want to buy me one! I know I cannot have you coz you are meant to be shared. 6) Readers of your blog. So don't worry, all your readers like you ? Of all my readers who gave comments, you are the most enlightening one. Your words spur me to write further. Thank you so much again.